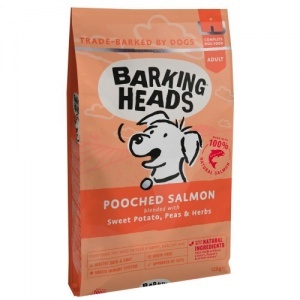 Barking Heads Pooched Salmon is a grain free hypo-allergenic limited ingredient recipe, packing in a hefty minimum of 45% salmon. Pooched Salmon is carefully formulated for all dogs and especially those that can be a little fussy about what they eat! A complete balanced food for adult dogs with sweet potato rich in antioxidants and anti-inflammatory nutrients. It also helps stabilise blood-sugar levels and lower insulin resistance. 45% Scottish Salmon – hypoallergenic protein full of amino acids for health and vitality. Skin and Coat Care – helps to relieve itching and excess shedding and promotes fur regrowth. Hip and Joint Care – Glucosamine and Chondroitin nourish and repair cartilage in joints.